Your hotel in Cologne is centrally located in the Braunsfield district, in close proximity to the city center and all the city’s main attractions. The nearby tram station makes travelling within Cologne a breeze and with the Autobahn just minutes away, getting to/from the Cologne-Bonn airport couldn’t be easier. The architecture and décor of your hotel will instantly impress you with warm colors and fine fabrics. Each of the 178 modern double rooms is fully equipped with the amenities of home. Start your day with a hearty breakfast in the morning. Cap off your night with a cold beer or a fun cocktail at the hotel’s Bellini bar. After a full day in Cologne, relaxation is at your fingertips in the Wellness center, complete with Finnish sauna and solarium. If you’re after something sportier, try out the cardio equipment or enjoy a walk or bike ride through the Cologne City Forest. A city trip to Cologne is a trip through history: Roman ruins, medieval architecture, Gothic splendor, classical art, all combined with modern cuisine and entertainment and the excitement of Carnival. This is Cologne. Opera, musical theater, museums, art exhibits, plus a bubbling nightlife make a vacation in Cologne an unforgettable one. 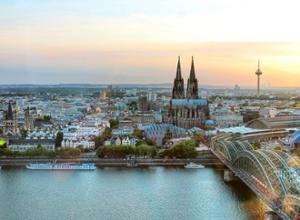 As the face of Cologne, the cathedral dominates the skyline and is not to be missed. The Rhine and the promenade of the old town will guide you on romantic jaunt through the city. Cologne is renowned for it media and culture, and the variety of shopping, sport and leisure opportunities available attest to that. In case you’re still not sold, Cologne has the most bars per capita in all of Germany. Welcome to Cologne.